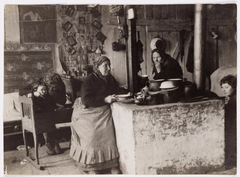 Collection-level Record Kacyzne, Alter (1885-1941). Papers. 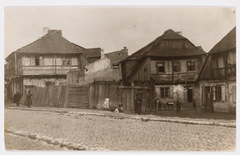 Bialystok. 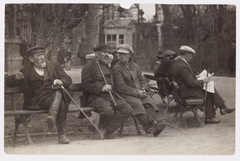 'Unemployed weavers taking the air,' sitting on a park bench. 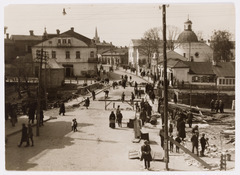 Bialystok. 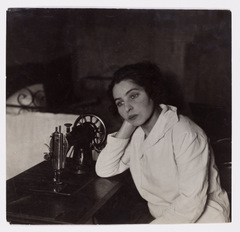 Portrait study of an unemployed seamstress sitting at her (Singer) sewing machine. 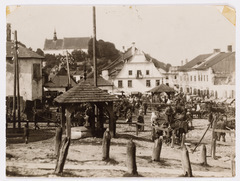 Bielsko Biala. 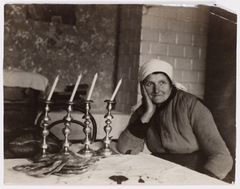 Portrait study of the daughter of the 'Byaler Rebbe,' Avrom Yehoshua Rabinowicz. 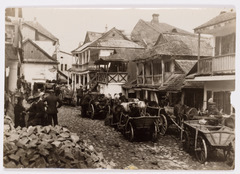 Bielsko Biala. 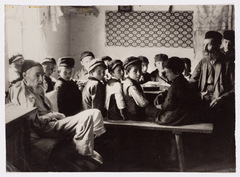 The 'melamed' (teacher) with students in a 'kheyder. 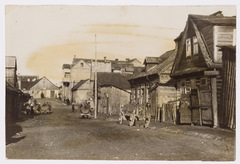 Brzeziny. 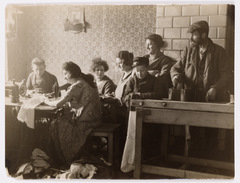 A portrait of a tailor and six members of his family, together at work. 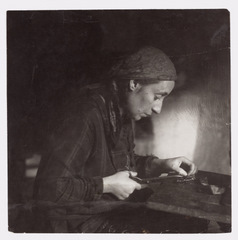 Czortkow. A view of the main street on a Sunday afternoon. 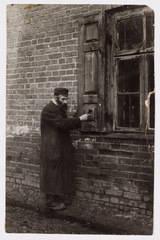 Czortkow. 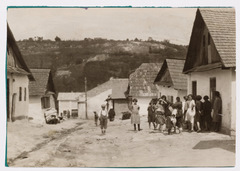 Women and children gathered by houses on an unpaved street at the foot of the mountains. Dabrowica. 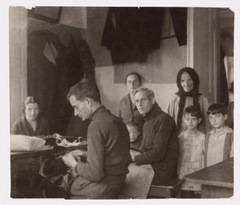 A tailor and his family: two men work at a table while women and children pose. Dlugosiodlo. 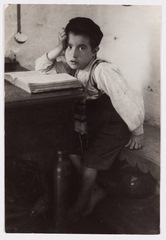 A man sits for an informal portrait with a child in his home. Dlugosiodlo. 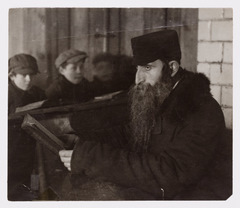 Informal portrait of a class at Leyzer Segal's 'kheyder' (traditional Jewish elementary school. Falenica. 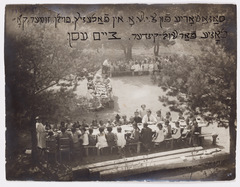 Children and staff at lunch at an outdoor dining room area at a summer sanatorium for school children run by CYSHO. Falenica. 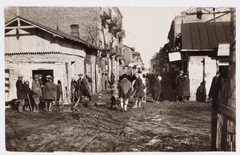 View down an unpaved, muddy commercial street. Gora Kalwaria. 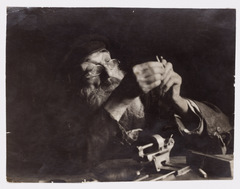 Naftole Grinband, a clockmaker, at work. 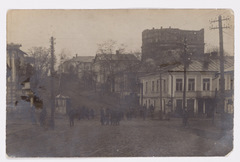 Grodno. 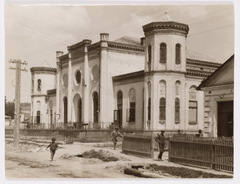 The facade of the main synagogue of the city. 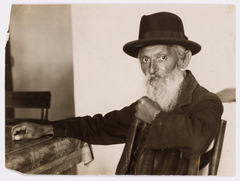 Horochow. 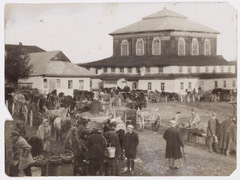 On a market day, at a corner of the marketplace near the synagogue (two-story building at right); merchants selling fruit from baskets. 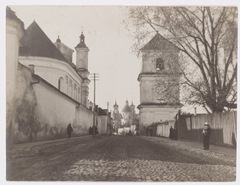 Hrubieszow. 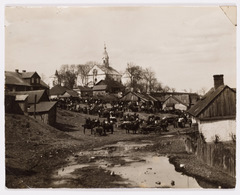 The muddy marketplaces on a market day; horse and wagons near a church. 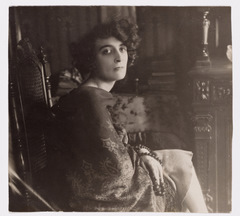 Husiatyn. 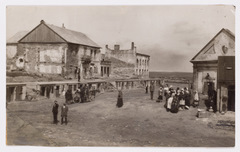 A view of 'the marketplace in the devastated city. 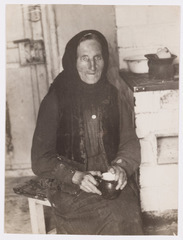 Husiatyn. 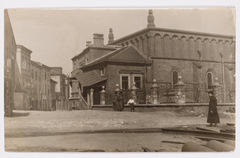 A view of the 16th century fortress synagogue. Ignatki. 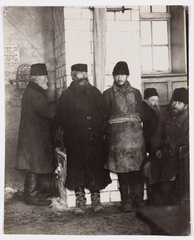 On a market day, Ukrainians and Jews trade. Karczew. 'Seven children sitting, sitting by a spring, a well. Karczew. 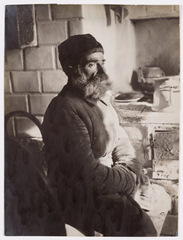 Portrait of an elderly furrier at work. Karczew. Portrait study of a grandmother and granddaughter. Kazimierz Dolny. 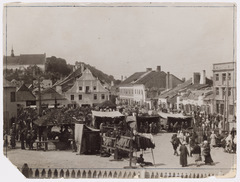 A view of the marketsquare on a market day. 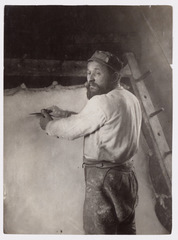 Kazimierz Dolny. 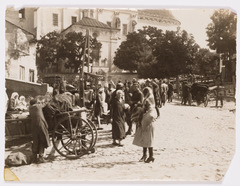 Merchants and customers on a marketday in front of the church. 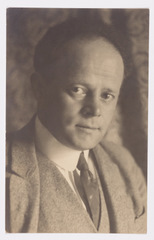 Kazimierz Dolny. The busy marketplace where clothing is being sold. 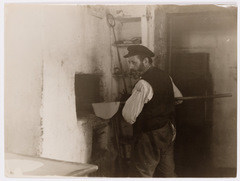 Kolomyja. 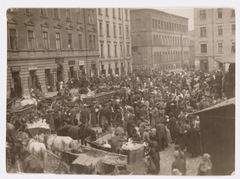 Peasants and Jews and horse-drawn wagons laden with produce and goods in the marketsquare on a market day. 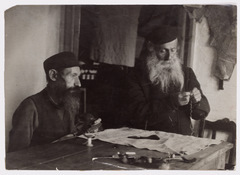 Kopyczynce. 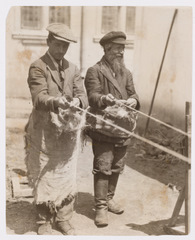 'A Jewish trade--rope spinners, father and son. Kopyczyńce. 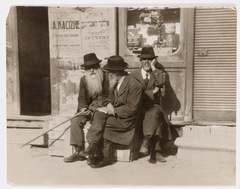 Busy street scene outside a Jewish-owned inn. 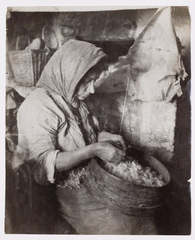 Kozience. 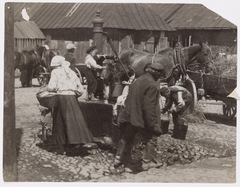 Men, women and children at water pump in marketplace. Kozienice. 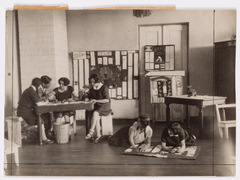 Four young women work on embroidery near a window. 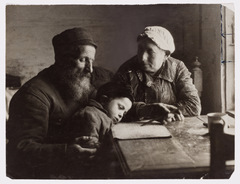 Krakow. 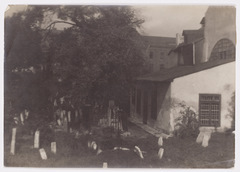 'The REMA's grave near his synagogue. Krakow. 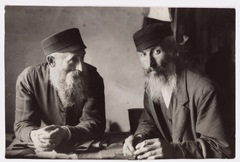 Jews by the old synagogue in Kazimierz (the old Jewish section of the city) built in the latter part of the 14th century. Krakow. 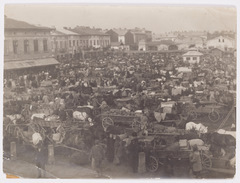 View of the goose market near Ester Street. 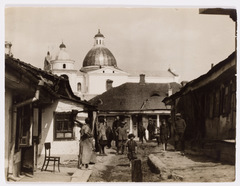 Krynki. 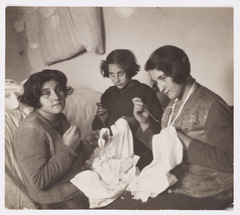 Three seamstresses working together. Krzemieniec. 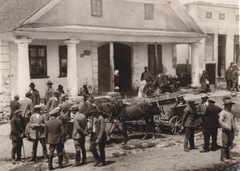 Horses and wagons on Broad Street. 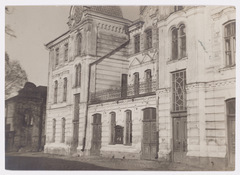 Kutno. 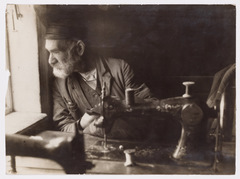 Portrait study of Arn-Nokhem, sitting at his sewing machine near a window looking out. 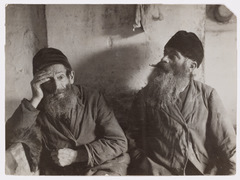 Lipkan. Portrait study of a woman plucking feathers. 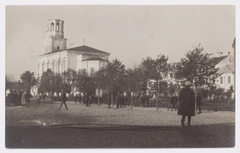 Lodz. 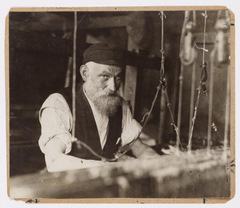 Portrait of a Jewish hand-weaver at his loom in the Baluty neighborhood. Lodz. 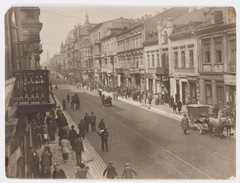 View of Petrikower Street near the intersection of Zavadska Street: passersby and vehicles on a commercial street. Lublin. 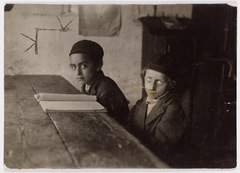 A boys 'kheyder' (traditional elementary school) in session. Lublin. 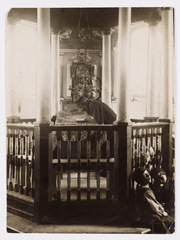 A man at study, two boys (right) doze on the step leading to the bimah, in a synagogue in the outskirts of the city that dates back to the time of the Tatars. Lublin. 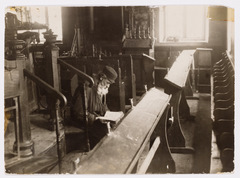 In the oldest synagogue in the city, the synagogue of Saul ben Judah Wahl (1541-ca.). Lublin. 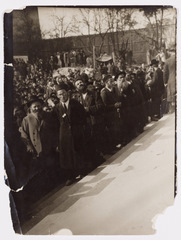 Men and women standing on a mound near the fence are crowded into the yard listening to the speeches given from the balcony at the opening of the Lublin Yeshiva. Lublin. 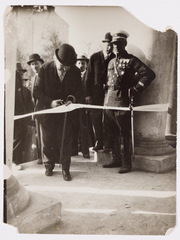 The cutting of the ribbon at the ceremony marking the opening of the Lublin Yeshiva. Lublin. 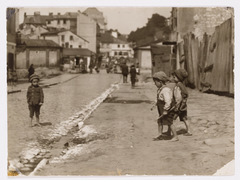 Three barefoot boys on a cobblestone street. Lublin. 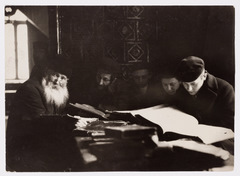 Young and elderly men studying the Talmud in an old synagogue. Luck. 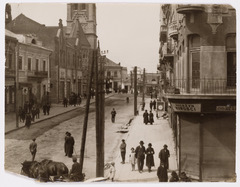 On the street that runs through the city over the river; men at work on the bridge which is under construction; people walking on their way. Luck. 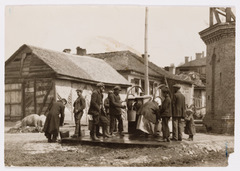 People filling up pails at a water pump in the marketplace near dilapidated buildings. Luck. 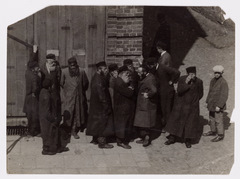 People pose in an alley in a Jewish residential neighborhood. 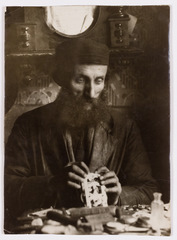 Lukow. 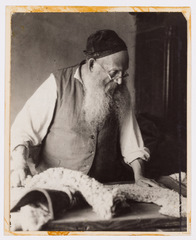 An unidentified tanner treating a stretched animal skin to make parchment for Torah scrolls. 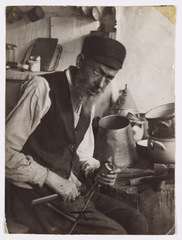 Lukow. 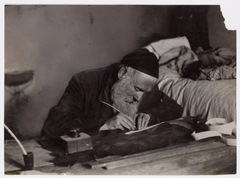 Portrait study of Moyshe-Yankev, 'the town's oldest scribe' at work with a quill pen near his bed. Maciejowice. 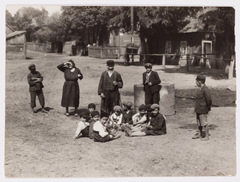 Passersby and children at a wooden foot-bridge in one of the oldest Jewish settlements in the area. 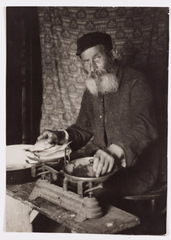 Makow Mazowiecki. 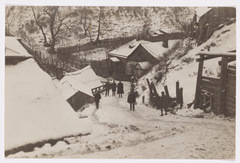 On an unpaved street that runs through a residential neighborhood, people and horse-drawn carts. Miedzeszyn. 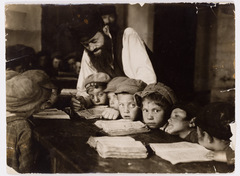 'They make a newspaper - the children editors in the Medem Sanatorium' Teenagers work with teacher, Menukhe Zaltzman in a classroom. Miedzeszyn. 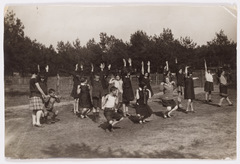 Children at the Medem Sanatorium. Miedzeszyn. 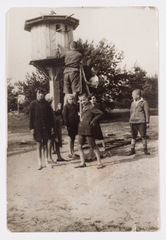 Children posing at the pigeon coop, at the Medem Sanatorium. Miedzeszyn. 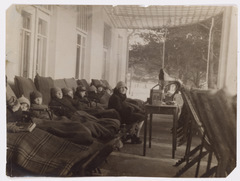 Children sit wrapped in blankets on the porch of the Medem Sanatorium listening to the radio. Miedzyrzec. 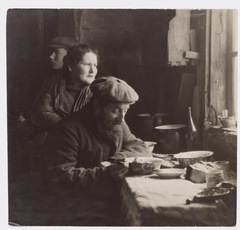 A brushmaker in his hat and coat eating a meal by the window, at home, with his family. Ostrog. 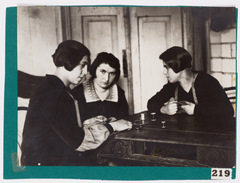 'Leyvi Soyfer, the scribe (right) with his two 'unequal' students, one old, one young, at the end of a table by a window. Ostrog. At the center of town, clusters of people stand across an intersection. Ostrog. 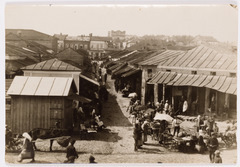 View of a busy commercial street with shops and sidewalk vendors. Ostrog. 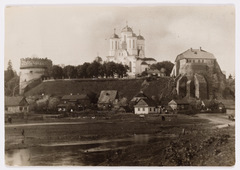 View of a church and the towers of the castle which was connected by an underground passage to the MAHARSHA Synagogue, (built in the mid-17th century), at the other end of the town. Ostroleka. 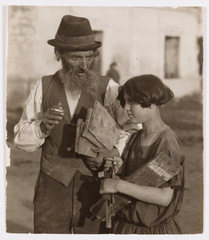 At a corner of the marketplace, men and women are selling produce from stands and children loiter. Otwock. 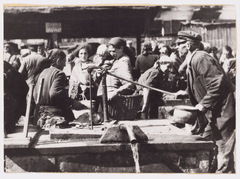 A water pump in the crowded fish market. 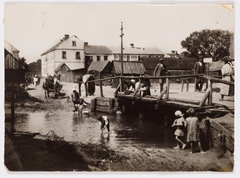 Otwock. 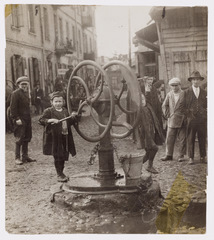 Two unidentified boys working the wheel of the town pump. Parysow. 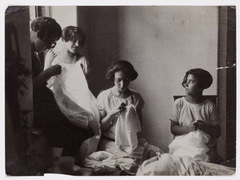 Esther the seamstress at work. Piaseczno. 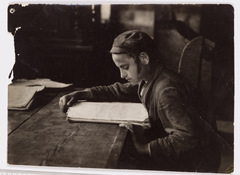 Portrait study of a boy studying a page of the 'gemore' (Talmud). Piaseczno. 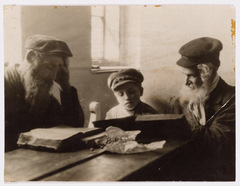 Portrait study of two boys at a long table over an open page of Talmud.